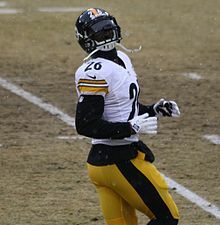 Le'Veon Andrew Bell (/??le??vi? ?n/ LAY-vee-on; born February 18, 1992) is an American football running back for the Pittsburgh Steelers of the National Football League (NFL). He played college football at Michigan State, and was drafted by the Steelers in the second round of the 2013 NFL Draft.